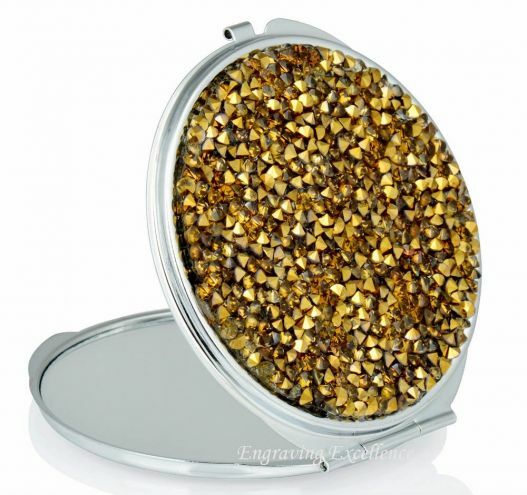 Engraved compact mirror offers one of a kind opportunity for the recipient to feel special and loved. What is more, including a witty or a sweet message means it will be cherished for years to come, especially if given on a big, life-changing occasion, thus preserving a beautiful memory. A bachelorette?s party is a time for celebration and fun, but there?s also feelings of an end of an era as the marriage approaches. You can preserve the memory of this special time with one of the huge number of engraved gifts available. Take the engraved compact mirror, for instance. A cute and witty handbag style compact mirror can bring roars of laughter, while a heart-shaped one can be a sweet reminder of the past. Keep it as simple or complex as you want ? you can include a long message to the bride to be, or just a date in stylish cursive font. The compact mirrors come in a range of sizes, so if you pick a bigger one, you can include the names of all of the bridesmaids for a beautiful reminder of your friendship. This would turn your personalised gift into a one of a kind treasure, and the recipient would be reminded of the special event each time she reached for the compact mirror. If she would prefer a smaller mirror, you can pick a cute one that she can slip into a pocket and use it as a practical gift that it is. There is no end to the creative uses of a personalised gift, so pick the best design and let your imagination be the creator of something that is truly beautiful and cherished. If you are looking for something that will last, can mark a joyful occasion, and something that can also be used in everyday life, why not pick one of the beautiful engraved compact mirrors? These mirrors are available from our extensive selection at Engraving Excellence, for any taste and occasion. To check out our full range, visit us at http://www.engraving-excellence.co.uk/.